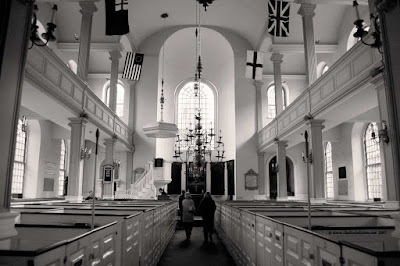 Interior view of the famous Old North Church of the American Revolution - "One if by land, two if by sea..."
I think that Mari_Nanci would love to see this photo. Beautiful light in this church so simple and clean looking. Thank you Fénix, for telling me of this photo. Wow.... beautiful... I love the B&W.... and such history. Snooping thru your Blog entries, I found the one about the Old North Church. Like I said before, I'd like to see this place for myself. The Old Walls of that place would have allot to say, if they could talk. It looks similar to the Old Christ Church that is down in Philadelphia. It, also, is one of the oldest Church's still in use today. Located just outside of the Historical Independence Park, where the Declaration of Independence was signed the Old Christ Church is an interesting place to visit. Famous people such as Ben Franklin, Thomas Paine, George Washington, and Thomas Jefferson all attended this Church a long time ago.